ON September 26, forest dwellers of Chandrapur district in Maharashtra locked up the Chichpalli range forest office, demanding payment of their dues under Joint Forest Management. The next day, they stalled the auction of timber and fuelwood at Sindewahi forest depot and demanded that auction proceedings at Khadangi and Sawargaon depots in the Brahmapuri range be also cancelled. 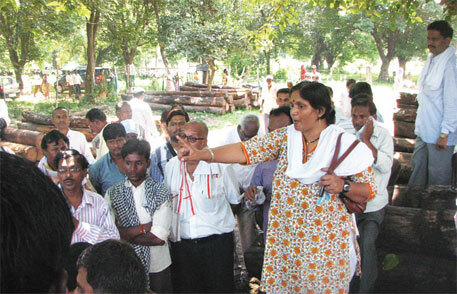 What the people were demanding is their share of the earnings made from forest produce. As part of the Joint Forest Management (JFM) scheme, launched in Maharashtra in 1992, forest dwellers are paid a share of the earnings from forest produceÃ”Ã‡Ãªin return for their help in forest conservation. But despite repeated agitations for their rightful share, the forest department has failed to clear Rs 85 lakh for 530 JFM committees (JFMC) in Chandrapur. The agitation was stopped only after local MLA Sudhir Mungantiwar and state home minister R R Patil assured the JFMCs that the issue would be sorted through a meeting between finance and forest secretaries. The villages had protested earlier in June this year, too. At that time the chief conservator of forests, in consultation with forest secretary Pravin Pardeshi, had assured the people that the issue will be resolved in a month. However, no decision has yet been taken and the Maharashtra government’s promise to deliver the benefits of JFM scheme to forest-dwelling tribals and non-tribals in the state remains unfulfilled even 21 years after the scheme was launched. Activists say the department is taking suspiciously long to release the promised funds to JFMCs. In May 2012, Maharashtra’s revenue and forest departments had issued a government resolution (GR), releasing Rs 74.51 lakh to 10 JFMCs in Gadchiroli and Gondia districts. At that time Pardeshi had told Down To Earth that this would be followed by payment to more villages. He had also agreed to the demand of these 10 JFMCs from Gadchiroli and Gondia that they be provided details of the records of the money they have been paid. Despite a lapse of 16 months, neither promise has been fulfilled. Pardeshi could not be reached for comment till the magazine went to press. The forest department is yet toÃ”Ã‡Ãªevolve a transparent procedure to calculate the share to be paid to JFMCs. In the May 2012 GR, the share of Mendha Lekha village was calculated at Rs 5.26 lakh, whereas in a communication in December 2010, the department had given the figure of Rs 3.94 lakh just for bamboo harvested in 2003 and 2004. “Going by this figure, the total share from bamboo, timber and fuelwood extracted from Mendha’s forests since 1997 when the village came under JFM should be in crores,” says veteran forest rights activist Mohan Hirabai Hiralal. The situation is similar in the current case. Goswami saysÃ”Ã‡Ãªthe JFMCs in question have worked with the forest department to draw up a detailed village-wise account of timber, fuelwood and bamboo harvested from JFM forests, but there is still confusion regarding whether villages should be given 50 per cent of the proceeds, as provided in the 1992 GR or 20 per cent, as provided in the later GRs. In villages like Satara Tukum and Gilbili, where committees were formed before the 2003 GR came into force, the initial memoranda of understanding were drawn up according to the 1992 GR, and hence people feel they should get 50 per cent share. Another bone of contention between the committees and the department is the manner of spending the village share. While officials insist that the amount be used for “village development”, people want to use it according to their gram sabha resolutions.